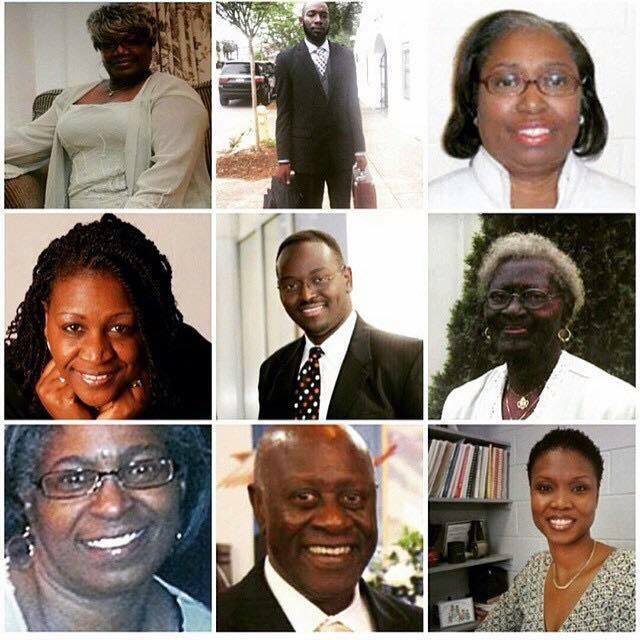 This blog post is in memory of the nine people who died in Emanuel AME Church in Charleston last week. While we fume and fuss about flags and statues, and while we debate about statues and plaques, the families of these innocent people are in the throes of mourning. Allow me to honor the dead by listing their names. They were our fellow citizens, fellow human beings, Christians gathered in their own house of worship to study scripture. They were praying. They were the kind of people we need more of in this country, and their killer snuffed out their lights in an instant. They were the Rev. Clementa C. Pinckney, Depayne Middleton-Doctor, Susie Jackson, Daniel Simmons, Ethel Lance, Myra Thompson, Tywanza Sanders, Cynthia Hurd, and Sharonda Coleman-Singleton. I wish we could grieve for them without all the debate and argumentation. I wish there were some self-imposed moratorium on the political wrangling so that the extinguishing of their lives could fully be recognized as the evil that it is. These, our fellow citizens, were worth more than any flag on any poll, and the immediate turn from their deaths to debate about the past and the symbols of the past seems disrespectful to me. It’s disrespectful to them and to their memories. As they lie among the dead, I feel unclean and lousy using this time to engage in political debate. Yet this is where we find ourselves. I regret it because I believe it detracts from the honor we should give to the dead. This debate over symbols will divide us just when we should be united in grief and in a commitment to teach our children why racism and violence are wrong. What political pressures are being exerted? What social agendas are at work? What parts of history are being overlooked? Who is being demonized and painted as an outcast? Who will die next? Go back to the list. Look at their names. Read them aloud and remember that each was a person with plans, dreams, and hopes. Read those names again. Honor the dead. Debate the politics of the day if you must, but remember what is most important. “What does the Lord require? To act justly, to love mercy, and to walk humbly with your God” (Micah 6:8). I choose to honor Rev. Clementa C. Pinckney by naming racism for what it is, Depayne Middleton-Doctor by contributing to the removal of symbols that encourage racism, Susie Jackson by calling for the demythologizing of racist idols, Daniel Simmons by pledging to support all efforts to bring about racial harmony, Ethel Lance by insisting that government be a strong bulwark against racial discrimination, Myra Thompson by working to increase awareness of the structural sin of racism, Tywanza Sanders by calling on my fellow southerners to move past the Confederacy, Cynthia Hurd by cooperating with all those who promote civil rights for everyone, and Sharonda Coleman-Singleton by praying for racial peace and the well-being of everyone, especially African-Americans. I REFER To a previous posting made in regard to married men, who are cradle catholics, with a life long vocation to Catholic Ordination, but are denied because of the marriage. In my case, my vocation to Catholic Priesthood, was stolen from me when I was a young man, (details of which are not for this posting). However, I now note the report of a Fr. Bernard Brien, a French Priest, being ordained as a Catholic Priest, even though he was married and devoiced a number of times. How Come????? Thank you for your post. I will look into the account of Fr. Brien. In the meantime, your point is exactly why I became an Episcopalian: in order to respond to a lifelong vocation.